Willow & Everett consider themselves as producer of lifestyle products for special moments. This could gloriously backfire with overdesigned, pricey devices nobody wants. Luckily for W&E, they got it right with this ceramic temperature controlled kettle. It looks like a retro coffee pot with a short gooseneck spout. Great material, simple yet elegant design. The white-grey trellis pattern suggests tradition, style, and functionality. Not bad for an electric kettle but how well does it do its job? The 1.6l water boils in about 7 minutes. The W&E kettle comes with all features you would expect from such a device (see here for full list). The range of programmable temperatures starts with 160°F/71°C which is sufficient for most teas (except Japanese green teas like Matcha or Gyokuro). The temperature setting is part of the base. You pre-select the temperature by pressing the relevant button and turn on the kettle. A beep will tell you when the heating process has finished. As with all gooseneck spouts, be aware that the water will cool down slightly when pouring it out. Due to the use of ceramic, the kettle is quite heavy to lift. When filled to capacity it weighs about 8lbs/3.6kg. Great if you are training for the next arm-wrestling competition but impractical for kids, the elderly and thin-armed people. On the plus side, ceramic offers excellent heat retention capability, so your water stays at the right temperature for longer (like the good old tiled stoves). Like with many lifestyle products it is really up to you and your preferences. 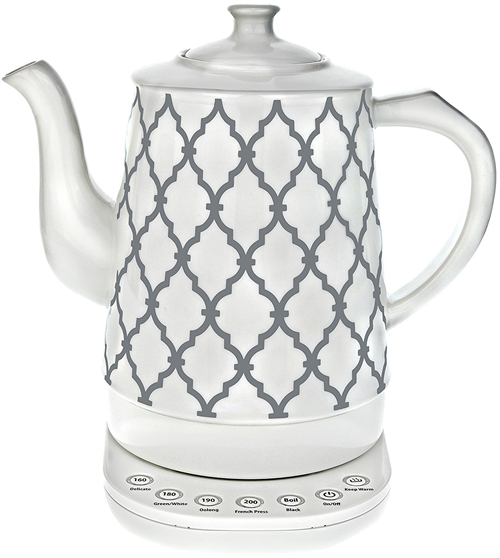 There are other kettles that do the same for a smaller price, but they don’t look as stylish. 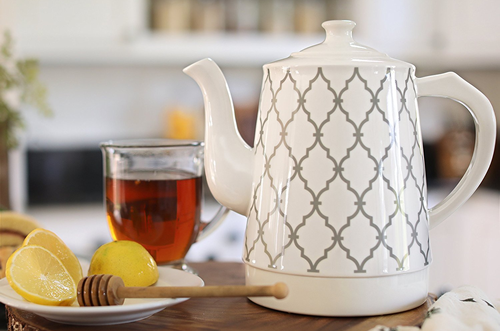 If you like the material and the retro design, we can highly recommend the W&E ceramic kettle. Bella 1.2l electric Kettle (no temperature control), more info here. (no temperature control, but with a very cool feature: the peony flowers on the outside change from blue/purple to pink/yellow as the water heats up).